Make Rosemary sugar syrup by placing sugar and water in small saucepan over a high heat. Keep stirring with a wooden spoon until sugar has dissolved. Add rosemary sprigs. Once syrup starts to boil leave on the stove for and couple of minutes then remove and allow to cool. Once syrup has cooled fill mason jar or something similar ¾ with ice. Using lemon squeezer, squeeze juice of ½ a lime into glass. Using jigger measure and pour vodka, rosemary sugar syrup, cranberry juice and ginger beer into glass. Stir with barspoon until mixed well. 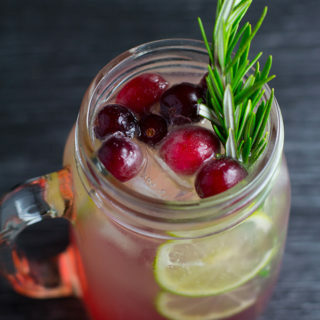 Garnish with a few lime slices, a rosemary sprig and a few cranberries. To serve as a non alcoholic drink just leave out the vodka. If serving as a non alcoholic pitcher you can add the vodka to the adults cups and mix before serving.